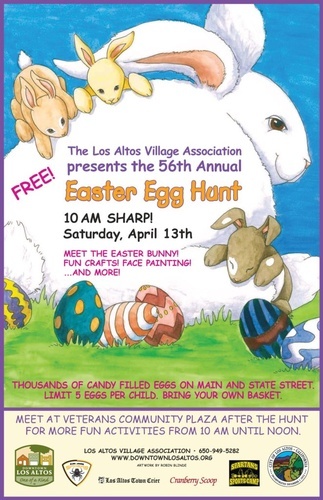 Join the merchants of Downtown Los Altos for the 56th Annual Downtown Los Altos Easter Egg Hunt Saturday, April 13, 2019 from 10am-Noon. Free for children ages 1-10. Thousands of candy and prize-filled eggs on Main and State Streets. Head to Veterans Community Plaza to meet the Easter Bunny and take pictures! Fun crafts, face painting and more! Limit 5 eggs per child. Please bring your own Easter basket. Presented by the Los Altos Village Association.